When creating this blog, and working out what its purpose is, it came down to helping people upgrade their abilities in thinking. 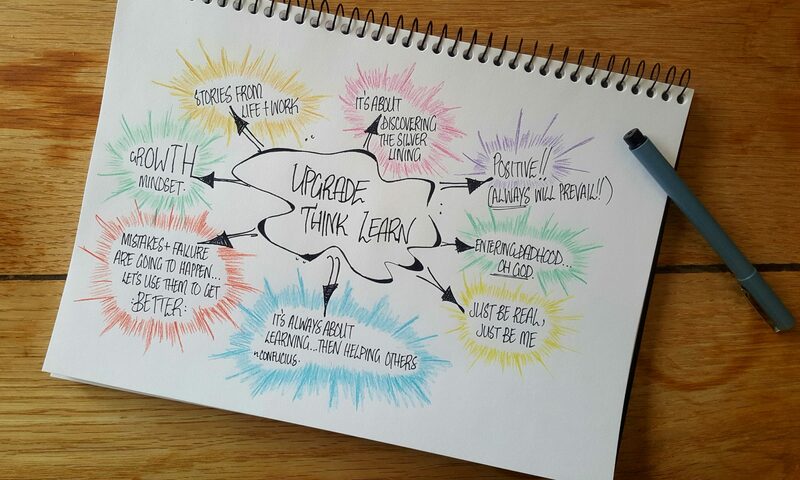 A run down of what Upgrade Think Learn is about is here, here or here. The hope is that through better understanding how you think, you can then improve in whatever area or skill you want*. Let’s help kick start an upgrade or three. Ultimately you choose what you want to focus on and how you want to shape your world. The amazing thing with upgrading your mindset is that it truly can work on a physiological level. The impact of your mindset can greatly impact you, your future and your potential, well, actually how close you get to your true potential…what I think of as Growth You. Dr Jo Boaler, Professor of Mathematics at Standford, speaks about this in a great way. Her focus is on maths education, but can really be applied across any area of our learning…because all of us can learn anything. This post is to help whoever is out there in their journey of moving towards a growth mindset. From experience this can be a bit of a long road, as it isn’t just about acting differently, it is about changing the way you approach nearly everything. Here’s a typical experience during a typical day in a typical classroom. So, that really does happen. More than you think. Now, this could easily cause hair pulling and a belief that the person in front of you simply can’t learn. Their talent and knowledge bucket is at its capacity and they have reached their potential. Counting back by ones is all there is forever (with some trouble too). Or, you make one slight change and upgrade the thing you choose to value: the process, not just the end result. Watch the clip one more time and you will notice a major thing – the focus was on getting the answer right. (Which also gives a little insight into the main child’s mindset and what she already values at 4 year of age). This 4 year old was acting out what she believes a teacher wants from students which happens in schools and businesses because of people being stuck in a fixed mindset. It’s not really their fault, their mentors and teachers showed them what they believed was important, but didn’t demonstrate the value of the how. Get ready to be schooled, yo. (Sorry, let’s pretend that last sentence didn’t happen). It’s Friday, so bring on that spelling test. You work your way through each word, listening attentively (maybe) to the words being read out by your teacher, or partner you’re working with. You get to one you should know, but don’t…Diffrent or different? Hmmm. You look down at the page and quickly think to yourself. You start writing and…no flashes of brilliance…so, you guess. Feeling uncertain, you casually move your hand to partially cover the word just in case it is wrong. Getting through the final few words it then comes down to correction time. Correct spellings are read out, some students fabricate their initial spellings (read:cheat) because getting things wrong is, well, wrong. So, how do we change that mindset? The most important part first: this does take time and you have to keep doing it. In the end, if it is your goal then no one else needs to be doing it for you**. There is no average time period for each step as it depends on what you are focusing on. Plus, when we are dealing with assisting others in upgrading their values it can take even longer. The first thing to upgrade is how you are seeing unknown knowledge or being uncertain about something. These are good challenges that will improve your knowledge or understanding (and in my case, ability to finally slam dunk). The more you look forward to the challenge of upgrading yourself, the greater your chances are to increase the number of connections and neurons within that lovely vital organ upstairs. Remember, admitting what you don’t know means you now know what you need to find out. So, you know what you need to find out, solve or improve in. Now is the time to upgrade how you mentally (and probably verbally) see your potential. It isn’t that you don’t know something or can never do something…you just can’t do it yet. How much time and effort are you willing to commit to be the best speller/dribbler/netballer/fashion designer/ Prime Minister you could be? Anyone can say anything. Once you write it down it becomes much more real, especially if other people you look up to or trust can see it too. Like Simon Sinek says, we are visual beings – we need to see what we are working towards. Put your goal or challenge up somewhere you will see it and you will remember that’s what you are working towards. Upgrading isn’t hard…changing what you believe or how you approach a challenge? That’s the tricky part. Never give up and know you can do it, if you are willing to do it. Question yourself and think about what needs to be changed, or what you missed. Adapt your ways of achieving things or solving problems – it’s only hard because it isn’t easy…yet. Create greater understanding and neuron connections in that brain of yours. Repeat as you continue to master a range of skills, concepts and knowledge. When in doubt, Question. Adapt. Create. Repeat. *Time, concentrated focus and repetition of the skill or knowledge you are improving is the secret…even Usain Bolt upgrades this way.